As the temperature drops and the dark nights set in, many people choose to take a seasonal supplement. 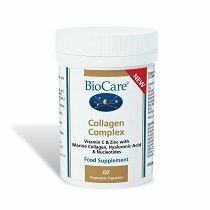 At BioCare, we offer a range of high quality seasonal supplements to support health and wellbeing. From high quality specific vitamin products like Vitamin C Powder, to expertly designed nutrient combinations such as Immune Intensive and BioAntioxidant 2000, there are a wide variety of products to choose from. Browse our seasonal supplements below, or find out more about our different seasonal formulations. Vitamin C is a powerful antioxidant and at BioCare we produce a range of seasonal supplements that supply a high level of this key nutrient. In many cases, these products are enhanced with rich flavonoids from berries and other fruits. For example, our Vitamin C Rosehip Complex powder provides 1000mg of vitamin C plus rosehip and bilberry in a base of xylitol, apricot, blackberry, and sweet cherry. Our Vitamin C 1000 supplement – a low acid, citrus-free magnesium ascorbate that is gentler on stomachs – also includes bilberry and grapeseed extract. Zinc is an important mineral for the normal functioning of the immune system. We have a variety of zinc products, including zinc in citrate form as it has a higher absorption rate. We have also developed a zinc formulation with vitamin C within our highly potent Nutrisorb® Liquid range. And our tasty ImmunoBerry® is a richly concentrated elderberry and zinc liquid supplement. Within our seasonal range, we offer a number of powerful antioxidant supplements. Immune Intensive – packaged as a week’s supply in convenient one-a-day sachets – includes a rich combination of vitamins A, C and D plus zinc, elderberry and sage. Our MicroCell® Nutriguard® Plus and MicroCell® Curcumin Plus use a unique process to enhance the absorption and bioavailability of their beneficial ingredients and BioAntioxidant 2000 is a broad spectrum antioxidant supplement with phytonutrients from 14 different plant extracts. During the winter months we have less exposure to sunlight, which can affect the amount of vitamin D we absorb. 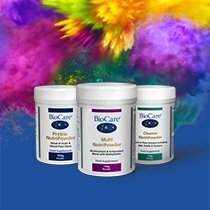 At BioCare, we stock a range of vitamin D supplements – including Nutrisorb® Liquid BioMulsion® D, which provides 1000iu of vitamin D3 per drop and uses advanced techniques to ensure optimum absorption. We also offer a number of seasonal supplements for children. 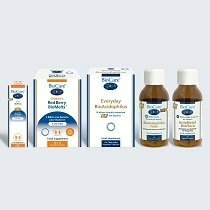 Children’s Red Berry BioMeltsTM provide live bacteria and vitamin D in a fruity ‘melt in your mouth’ powder and Children’s BioMulsion® D provides vitamin D3 in an emulsified form for optimum absorption.